The remote switching on of the lighting makes your approach to the vehicle easier in poor light. It is activated according to the level of light detected by the sunshine sensor. Press the open padlock on the remote control. The dipped beam headlamps and the sidelamps come on; your vehicle is also unlocked. The exterior welcome lighting switches off automatically after a set time, when the ignition is switched on or on locking the vehicle. The lighting duration is selected via the vehicle configuration menu. The duration of the welcome lighting is associated with and identical to that of the automatic guide-me-home lighting. When a low level of ambient light is detected by a sunshine sensor, the number plate lamps, sidelamps and dipped beam headlamps are switched on automatically, without any action on the part of the driver. 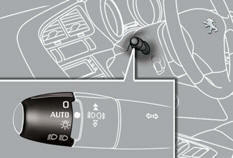 They can also come on if rain is detected, at the same time as automatic operation of the windscreen wipers. As soon as the brightness returns to a sufficient level or after the windscreen wipers are switched off, the lamps are switched off automatically. Turn the ring to the "AUTO" position. The activation of the function is accompanied by the display of a message in the screen. Turn the ring to another position. Deactivation of the function is accompanied by the display of a message in the screen. In the event of a malfunction of the sunshine sensor, the lighting comes on, this warning lamp is displayed in the instrument panel and/or a message appears in the screen, accompanied by an audible signal. Contact a PEUGEOT dealer or a qualified workshop. In fog or snow, the sunshine sensor may detect sufficient light. In this case, the lighting will not come on automatically. Do not cover the sunshine sensor, coupled with the rain sensor and located in the centre of the windscreen behind the rear view mirror; the associated functions would no longer be controlled. When the automatic illumination of headlamps function is activated, under low ambient light the dipped beams headlamps come on automatically when the ignition is switched off. Activation or deactivation, as well as the duration of the guide-me-home lighting, is set in the vehicle configuration menu.